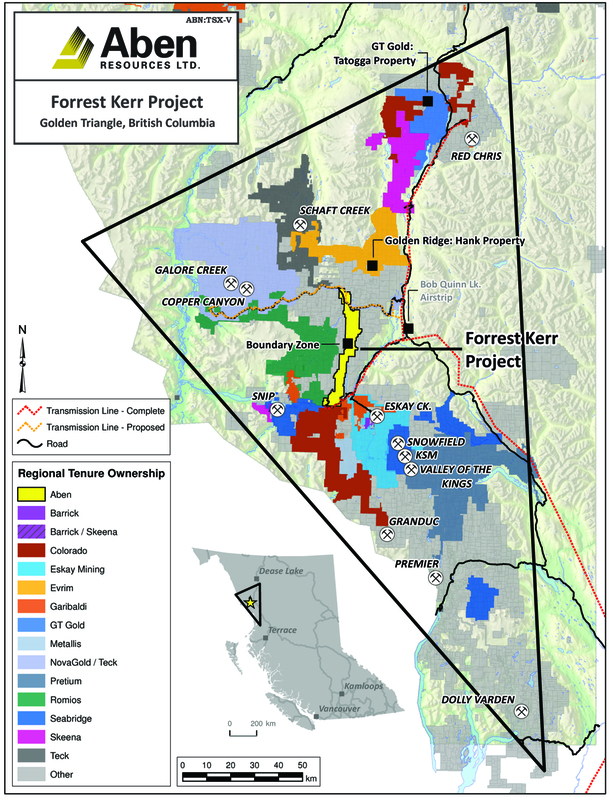 Vancouver, BC -- Aben Resources Ltd. (TSX-V: ABN) (OTCQB: ABNAF) (Frankfurt: E2L2) (the “Company”) announces that additional analytical results have been received from the early-stage drilling at the 23,000 hectare Forrest Kerr Property (the “Property”) located in the Golden Triangle region of British Columbia. 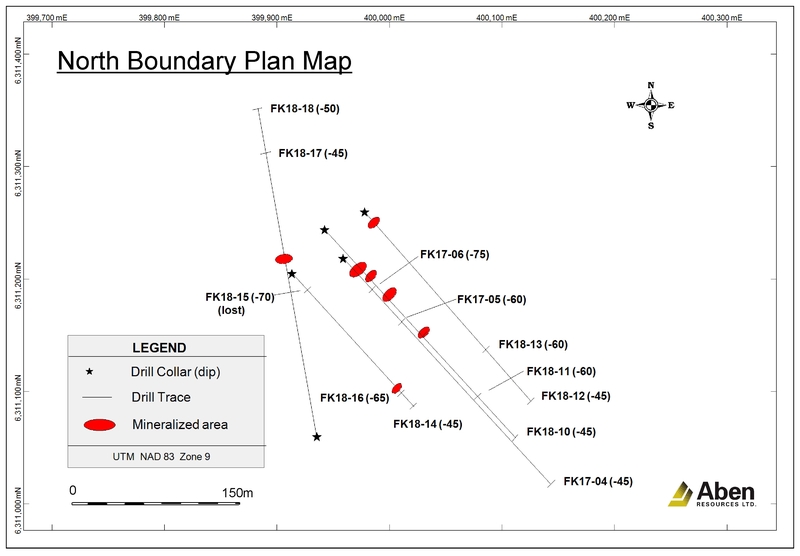 The eight drill holes reported here consist of step-out drilling at the North Boundary Zone and most of the holes intersected shallow, high-grade gold mineralization. Highlights include: 5.08 g/t Au over 12.0m in hole FK18-12; 23.3 g/t Au over 2.0m in hole FK18-13; and 10.62 g/t Au over 3.0m in hole FK18-17. To date, final analytical results have been received for 3,000m of a total projected 10,000m (table of values and hole descriptions near end of release). Jim Pettit, President and CEO of Aben Resources stated, “These high-grade step-out holes at North Boundary have expanded the zone which is open in all directions and confirm the presence of a robust mineralizing system in the area. Based on the geochemical and new geophysical data available to us we can clearly see the potential of the area that now includes the North Boundary Zone, the historic Noranda hole 230 meters to the south and the South Boundary Zone another 1.5 kilometers further south. Given the complex geology, we started using Oriented Drill Core techniques after these eight holes reported here which will help in identification of orientation and structure as well as to delineate additional high-grade mineralization. The target areas in and around the Boundary Zones are relatively shallow and continue to provide strong discovery potential as we have only systemically tested a very small area at shallow depths. 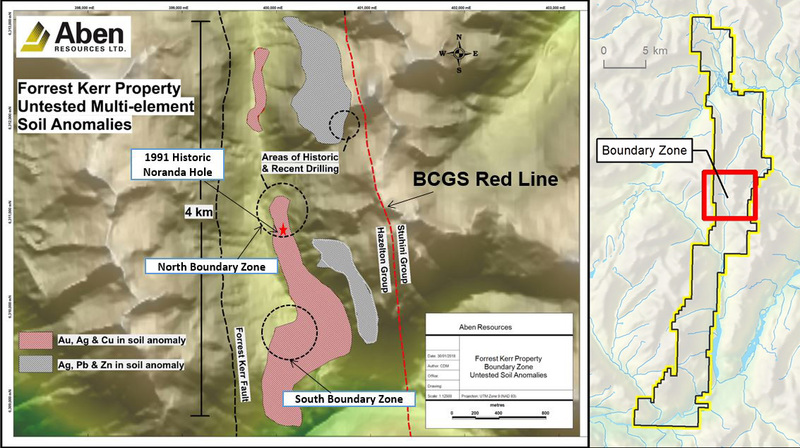 The Company is awaiting additional assay results from 27 holes, three of which are from South Boundary and the rest from the North Boundary Zone. This new high-grade discovery is still in its early days and with this increased drill program there will be news for some time to come. I would also like to welcome Eric Sprott as a new major shareholder and thank him for his support. The Company now has just over $7 million in the treasury from financings and the exercise of warrants. "